Words to Find. Enter the text you wish to search for. It must be more than one character - it is not clear why - or you get an error message. The case sensitivity of what you enter is a result of the operator you choose in the right-hand drop down. Criteria left drop-down (Scope). The choices are 'all' or 'any'. The choice indicates whether a match of all words or just any single word in the search box should generate a match. Criteria Right drop-down (Operator). There choices are those found in the Find dialog and are documented here. The choice made will affect whether the search text is matched in case sensitive manner or not. Find in Gallery. This controls the scope of Records searched. The default (no tick) is to search the whole Catalogue. If ticked, the search is only conducted against the Records in the current Gallery. 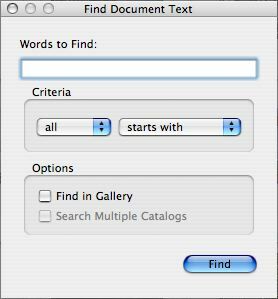 Search Multiple Catalogs. This is greyed out if only one Catalogue is currently in use. The default (no tick) is to search only the current Catalogue. If ticked, all open Catalogues are included in the search. Find Button. Click this to execute the search. Close Button. (Windows OS only) Click this to close the dialog. Alternatively, you may use the 'x'button at the top right corner of the dialog (Windows) or the red button at the top left corner of the dialog (Mac).